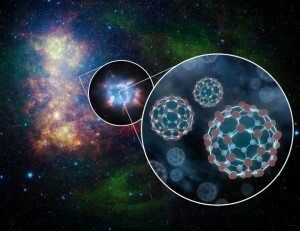 In the cold depths of space, interactions between gas and dust can produce a range of complex molecules. Everything from water and alcohol to the basic building blocks of life. 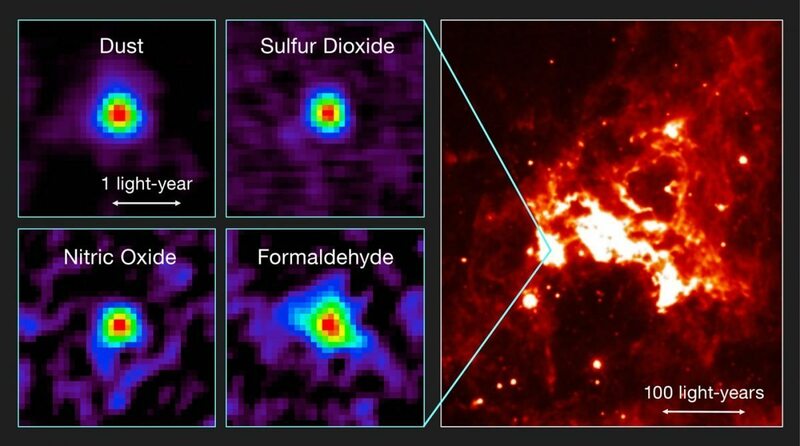 While much of this chemistry occurs in cold molecular clouds, molecules can also be produced in the warm regions surrounding a young star, in what is known as a hot molecular core. A few hot molecular cores have been observed in our galaxy, but recently one was discovered in the Large Magellanic Cloud. Somewhat surprisingly, the molecular composition of this extragalactic hot molecular core is strikingly different from the ones seen in our galaxy. The young star in question is known as ST11, and it was recently observed by the ALMA radio telescope array. ALMA is particularly suited to observe complex molecules in space, because it is able to view them at the kind of sub-millimeter wavelengths these molecules often emit. ALMA was not only able to observe the warm dust around ST11, but also molecules such as formaldehyde and nitrous oxide. The region is lacking other molecules such as methanol, which are common in cold molecular clouds. Since the formation of different molecules depends not only on the available elements but also temperature and cloud density, the study of such hot molecular cores allows us to better understand complex molecular interactions in space, which can give us clues about how complex chemistry and even life formed on Earth. One key difference between the Large Magellanic Cloud (LMC) and our own Milky Way galaxy is that the LMC has a much lower metallicity. This means it has a lower fraction of heavier elements such as silicon, oxygen and iron. These elements are common building blocks of interstellar dust, which is why the LMC has a lower fraction of such dust. A great deal of complex chemistry can happen on the surface of dust grains as it interacts with surrounding gases, and a lower metallicity means such interactions are less common. We see this in the types of molecules forming around ST11. Given the density of ST11’s hot molecular core, the levels of molecules such as formaldehyde and isocyanic acid are a tenth to a thousandth of levels seen in the Milky Way. This demonstrates the central role of dust surface chemistry to the formation of these molecules. It’s a powerful insight into just how young stars can seed the cosmos with some of the complex molecules we see around us. I have a question ,Einstine’s theory was proven ,via Gravitational waves,that make great noise ,when black holes merged.Could Sound Create The Beginning of Time ,I know when light ,from one Galaxy collides with another ,atoms are formed to make matter. But what if great sound collided with each other? Could that create?